The hotel has 11 rooms. This hotel can be found in a delightful 18th century townhouse, situated on the historical main square (Dobo ter) of Eger, and within a few yards of the castle ramparts. At Dobó square you will find Hotel Senator-Ház, one of Eger's most prominent hotels built right below the walls of the famous Eger Castle that earned its name during the times of the Turkish invasion of Hungary. This 3 star hotel was built from the actual stones of the castle's outside wall lending a 300 year old ambiance to the building. With its 11 rooms, a restaurant, a café, a sauna, a patio that seats 80 people in the summer, it provides a historical atmosphere that is worth visiting for. From the turkish era this building is one of the few that remains to offer a friendly and peaceful atmosphere. The Café provides a source for both relaxation and entertainment. If you are on a business trip you can organize your meetings and press conferences here. The Hotel also contributes to the cultural success of Eger, the city which is known as the 3rd most visited tourist destination of Hungary. In Eger the Hotel Senator-Ház became the focal point of the city's musical and artistic life. On the patio you can take pleasure in the musical productions, concerts, open-air theatrical performances organized each and every night from early spring till late fall. Molnár C. Pál, Nagy Ernő and many others have been introduced through more than 50 exhibitions sponsored by the Hotel Senator-Ház in the last 15 years. 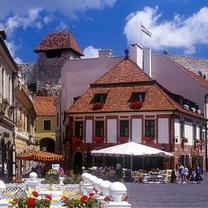 More information about Eger and its other hotels!